Motorcycles have been a timeless classic for more than a century now. Even today, there’s nothing quite like being on the open road on a two-wheeler. The sidecar, however, has not been quite as ubiquitous over the decades. But there is good news for those who get a bit lonely on their bikes. The sidecar is back! And some might even say we’re living in the golden age of sidecars—production of new sidecars is on the rise in the U.S., and vintage sidecars are selling for more than ever at auto auctions. There have been some spectacular brands and kinds of sidecars through the annals of motorcycle history. Check out five of our favorites, then hop in one and hit the road. Sidecars have been around since the early 1900s, springing from a 1983 French newspaper contest into the mainstream motorcycle market a decade or two later. And as with any invention, early models had their setbacks and downsides. The Flxible Company, founded by Hugo H. Young in 1913 (a year before Harley-Davidson ® began marketing sidecars for their models), changed everything with its new prototype for a sidecar that allowed the third wheel to tilt, thus leaving the sidecar on the ground when the motorcycle went into curves rather than suspended in midair. 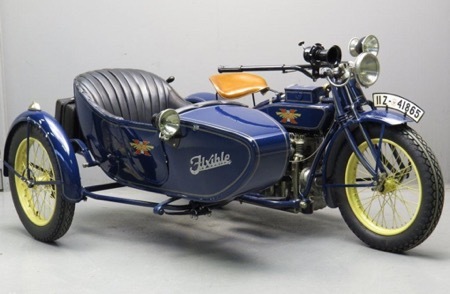 Needless to say, Flxible sidecars were a big hit, even though the company moved on to produce other types of vehicles after the Ford Roadster caused the demand for sidecars to dip just a decade later. Sidecars weren’t just created for adding an extra passenger, of course. Many different companies, from AAA and Firestone to druggists and cameramen, used sidecars to transport their goods and services. And with some sidecars holding up to 500 pounds, this was quite a utility back when automobiles were considered a luxury. Our favorite, though, has to be ice cream sidecars. Who needs all that overhead space and that bulky frame when you can store your cones and bars in a near, tidy sidecar? 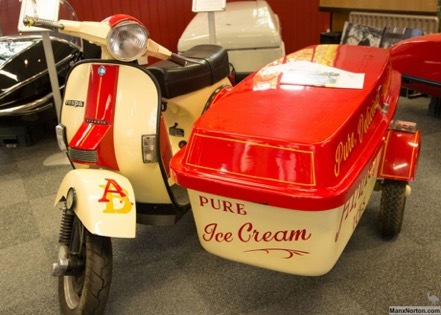 With sidecars making a comeback, you just might see the ice cream drivers in your neighborhood switching to these more compact alternatives. And it’s pretty darn charming, isn’t it? Ever noticed how Captain America rode a motorcycle with a sidecar back in the day? 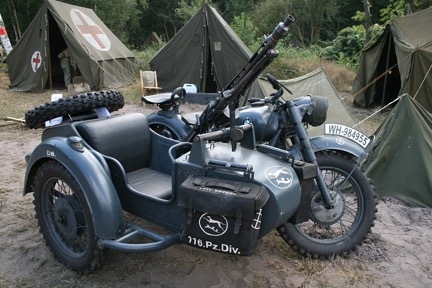 That’s because sidecars were a big part of both the Allied and Axis troops during World War II—specifically, sidecars outfitted with big machine guns or other artillery. 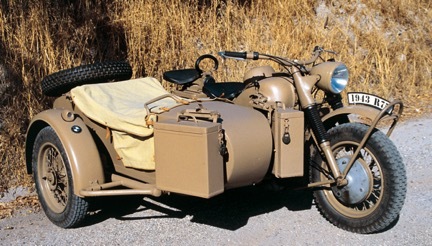 Sidecars were employed during World War I as well, but those were primarily used for dispatch services and transporting officers. The WWII outfits allowed gunmen unprecedented mobility that tanks and automobiles simply couldn’t offer. Want to dive into more of these war machines? Auto Wise has a fantastic and thorough list of 10 motorcycle sidecar rigs from the War that are as sleek as they are serviceable. As the sidecar evolved along with the motorcycle, it became increasingly important to have a sidecar that matches the aesthetic of your bike. Motorcycle manufacturers increasingly began pairing particular sidecar brands with their bikes for brand consistency. During the 1950s, that company for BMW was Steib Metallbau, which had been manufacturing sidecars since 1914. 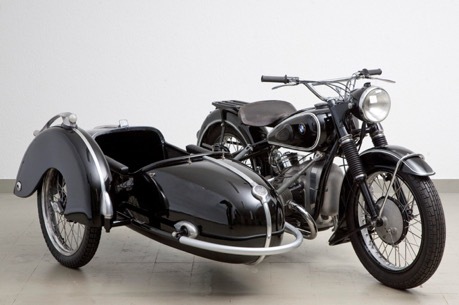 Their sleek and distinct design features were the perfect complement for anyone riding a Beamer bike, and according to the company itself, they accounted for more than 90% of all sidecars produced in Germany in their heyday. Nowadays, they’re a popular choice for vintage motorcycle fans. There’s nothing wrong with looking stylish while riding in comfort, right? Okay, this isn’t a type or a model. And yes, sidecars were designed with humans and/or supplies in mind. We’re not disputing that. But as with all things in life, the sidecar was improved (perhaps perfected?) by the addition of dogs. If your dog loves sticking its head out the window on a long car ride, or especially riding in the back of a pickup truck, they’ll love riding in a sidecar. 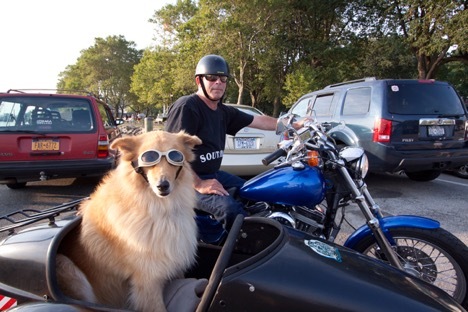 Just make sure to be extra cautious and maybe take it slow, since they don’t make motorcycle helmets for dogs. Do you own a sidecar for your bike? Tag us on social media and show us what you’re riding with! Valvoline does not endorse any of the products or manufacturers listed above. Use at your own risk. Valvoline does not guarantee, approve or endorse the content available on linked sites.